Understanding both Joule heating and electrothermal effects is critical for the proper design of microdevices. FLOW-3D provides a useful and robust flow simulation tool to model these physical processes. Joule heating occurs when an electric current passes through a conducting material, such as a fluid. At a microscopic level, Joule heating is caused by interactions between the moving charged particles. Additionally, if the fluid is di-electric, polarization will happen in the presence of an electric field causing fluid flow. FLOW-3D can capture all such effects, which is demonstrated by the simulation below that highlights FLOW-3D‘s ability to accurately capture electro-kinetics physics. The image above shows the arrangement of electrodes from a cell culture chamber. Electrodes in blue are at a positive potential of 9V and the electrodes in pink are at an equal negative potential, i.e., -9V. A conducting fluid is placed over the electrodes. The fluid has been given a value of di-electric constant, which causes polarization. Over time, the polarized particles in the fluid follow the electric field, inducing velocity in the fluid (the electric field is shown in top left of the animation below). This simulation shows a temperature rise of the fluid due to Joule heating. The temperature rises to 500° Celsius by the end of the simulation. 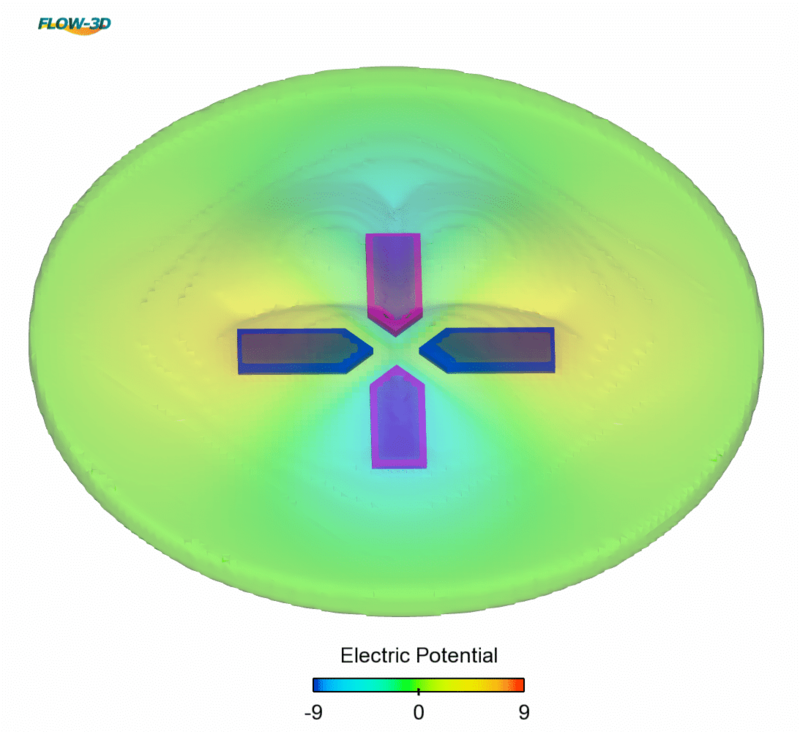 FLOW-3D captures the fluid flow physics of a di-electric fluid inside an electric field as seen in the right half of the simulation. Streamlines have been plotted using FlowSight in order to visualize the fluid flow and are colored by electric field magnitude. Over time, clearly visible distinct circulation cells are formed in the fluid as the polarized particles are moved around by the electric field. The top left plot in the simulation shows the electric field magnitude contours. Thermal bubble-driven printheads require some method of vaporizing a small volume of ink. The resulting vapor bubble pushes ink through a nozzle creating a tiny droplet which, along with millions of other droplets, creates a printed image. A common method of heating the ink is to pass an electrical current through a thin layer of metal to generate resistance, i.e., Joule heating. This FLOW-3D simulation shows a thermal bubble opening, where the heating element is inside the base. The duration and the magnitude of the electrical pulse must be chosen carefully so that the right amount of heat is generated. Too little heat will fail to vaporize the ink. Too much heat will cause the droplet to be too large and risks possible damage to the printhead. FLOW-3D provides all the tools necessary to simulate the many complex and intertwined physical processes in thermal bubble jet printheads.